Essential Enzymes 500 mg by Source Naturals came at a time of great need. It is really helpful and I will continue to buy it. I am very pleased with the quality of Essential Enzymes. The enzymes have helped my digestion greatly. Essential Enzymes were prescribed by my doctor. I hope to see the long-term benefits in a few months. Doctor advised me to take these for poor digestion. I take 1-2 with each meal and they make a world of difference in how my good is digested. Even though I eat very healthy these are still an essential part of my daily routine. Essential Enzymes™ 500 mg 240 Capsules from Source Naturals may aid the body’s natural digestive process and maximize the body’s utilization of nutrients. This supplement combines the properties of digestive enzymes that might help break down food groups like carbohydrates‚ proteins‚ fats‚ and fiber. As we age‚ all our bodily functions‚ including digestion‚ start slowing down. The production of hydrochloric acid and digestive enzyme secretion could decline over the years. 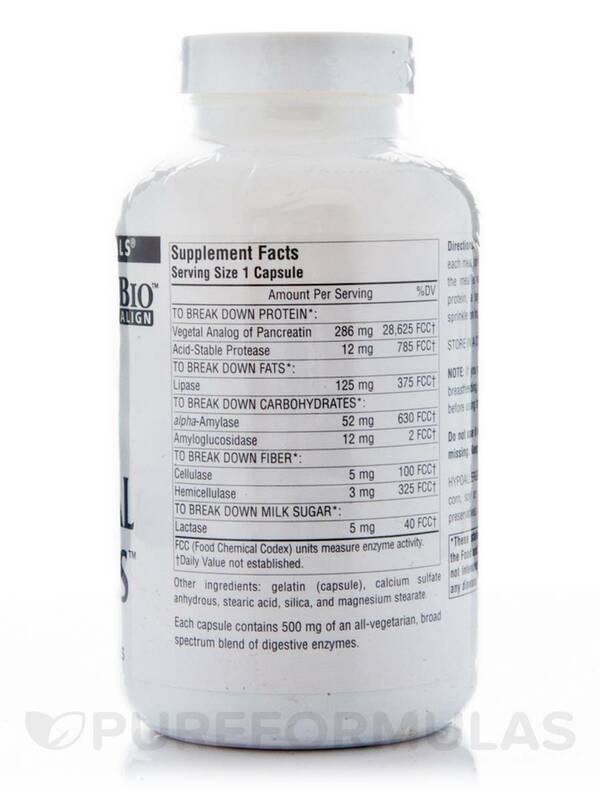 Essential Enzyme™ 500 mg 240 Capsules from Source Naturals is highly effective because it is a Bio-Aligned™ formula that contains a wide array of enzymes for different activities including the breaking down of proteins‚ fats‚ milk sugars‚ fiber‚ and carbohydrates. The supplement from Source Naturals may also aid the natural digestive process and help the body assimilate nutrients by breaking them into smaller components for easy absorption. The Essential Enzymes™ 500 mg 240 Capsules from Source Naturals contains no yeast‚ dairy‚ egg‚ gluten‚ soy‚ wheat‚ sugar‚ starch‚ salt‚ preservatives‚ artificial color‚ flavor‚ or fragrance. 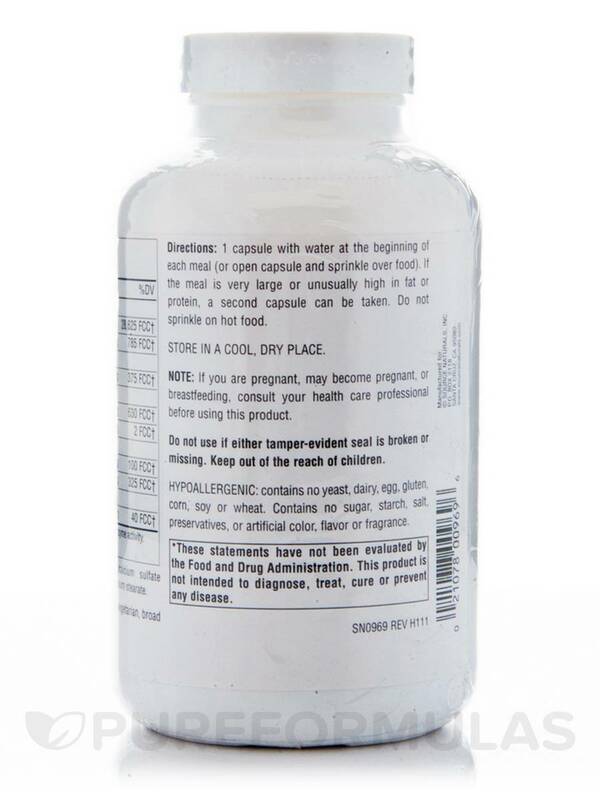 If you are pregnant‚ may become pregnant‚ or breastfeeding‚ consult your health care professional before using this product.Do not use if either tamper evident seal is broken or missing. Keep out of the reach of children.Store in a cool‚ dry place. 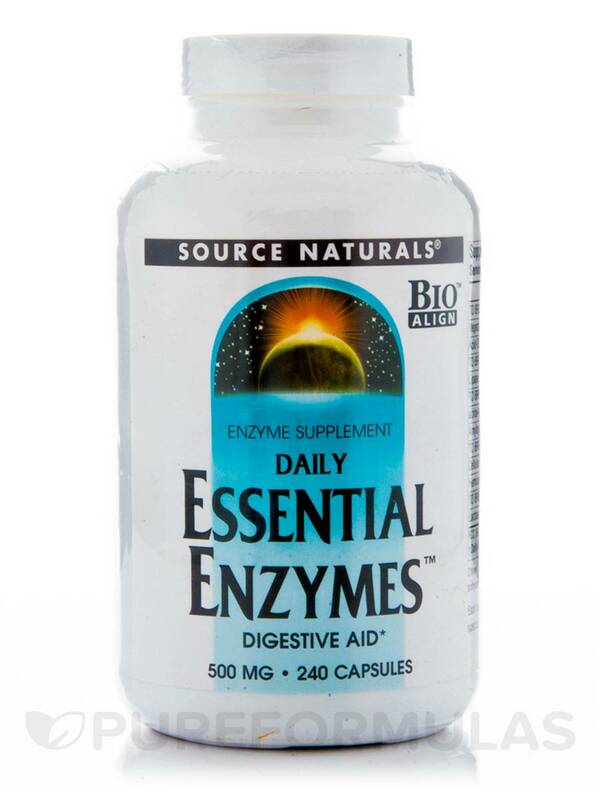 Essential Enzymes by Source Naturals does an excellent job at providing the best enzymes for digestive assistance. My doctor said Essential Enzymes 500 mg by Source Naturals are good enzymes and even suggested I take 2 with every meal. I've been using them for well over a year. Helps foods to digest and absorb much better. If you have any acidic indigestion symptoms after a few days of using 2 with meals, you may only need 1 for your dose. Works very well, also comes in veggie capsules. Essential Enzymes 500 mg was originally recommended to me by a very knowledgeable person at a local health food store. I had been taking a different digestive enzyme that wasnt working. Im now on my 4th bottle and am very pleased with the results. It helps move the digestive process along helps eliminate gas and bloating and assists in keeping me regular. I will be ordering Essential Enzymes 500 mg again.